was the secret identity of British pop musician Robin Scott. It was an alter ego he wishes he had kept secret. "At the time when I was putting the (record) sleeve together in Paris, I was thinking that I really needed a pseudonym which would create sufficient interest. I was looking out of the window and I saw this large 'M,' which you see all around Paris for the Metro, and I thought, 'Perfect. I'll take that. And the more people read into it, so much the better.' I should have never told anybody who I was." "Pop Muzik" was a hit in his home country first, peaking at number two on May 12, 1979. Three months later it entered the Billboard Hot 100 at number 61. The single topped the chart the week of November 3, and was the first and only record by M to chart in America, making Scott's musical personality one of the rock era's one-hit wonders. In Britain, M had three more chart hits, starting with "Moonlight and Muzak." 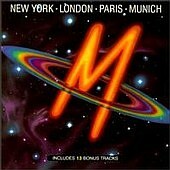 Released in the US on Dec. 22, 1979, M's New York - London - Paris - Munich album peaked at #79 on the Billboard Hot 200 and remained on the charts for 8 weeks. Its #1 hit "Pop Muzik" was certified as a gold single by the the R.I.A.A. the same month. The CD reissue (above) features "Hip-Hop," "Latino Cappucino" and "'89 Reshuffle" mixes of "Pop Muzik," along with 8 other bonus tracks. Scott describes the evolution of "Pop Muzik": "I was looking to make a fusion of various styles which somehow would summarize the last 25 years of pop music. It was a deliberate point I was trying to make. Whereas rock and roll had created a generation gap, disco was bringing people together on an enormous scale. That's why I really wanted to make a simple, bland statement, which was, 'All we're talking about basically (is) pop music." Originally, Scott managed an R&B band, then worked with an all-girl group in Paris. Friends encouraged him to go out on his own, so he recorded a couple of songs, including "Pop Muzik." "That was the third vesion of that song," he explains. "When I first wrote the song I made a kind of rhythm and blues version, a sort of funk version a la James Brown. Then I finally made the electronic version which it's famous for. (The third) definitely sounded quite different from anything that was around. "I knew that the idea was very good, but it needed to be presented in a very fresh, startling way. It took six months, because I was having to persuade studios to part with what we call 'down time.' I didn't have any money, you see, and I just said, 'Look, maybe you'll give me some of your time, free, so that I can make a record and I'll give you a point or percentage of whatever I make. That was the only way I could do it, so I had to sort of beg, borrow or steal the whole record. "I was using the studio rather like the artist would use the canvas. The technology, which was changing all the time, proposed different ways of doing things. It's like a workshop situation where you build layer upon layer. I worked like that through sheer necessity because I didn't actually have a working band. I just had one or two people who I knew were talented, and I kind of put them together at different times." That way, Scott was able to overdub whichever musician was available that day. "Electronic music was being employed for the first time in a commercial pop context, apart from perhaps Donna Summer's 'I Feel Love,' which was an inspiration to me. It had that kind of quirky machine-like feel which was to set a trend for the next few years. A machine is generating a pulse in perfect time, and so everybody follows the machine rather than following, say, the drummer who is always losing in a sense. Most music today is all based around the click of the bass drum or the sythesizer or whatever." After his initial LP, which included "Pop Muzik," Scott released three more albums as M, none of which were successful. He then recorded two LPs with Japanese pop star and film actor Ryuichi Sakamoto ( Merry Christmas, Mr. Lawrence ). In 1985, Scott recorded a new album in London titled The Kiss of Life.